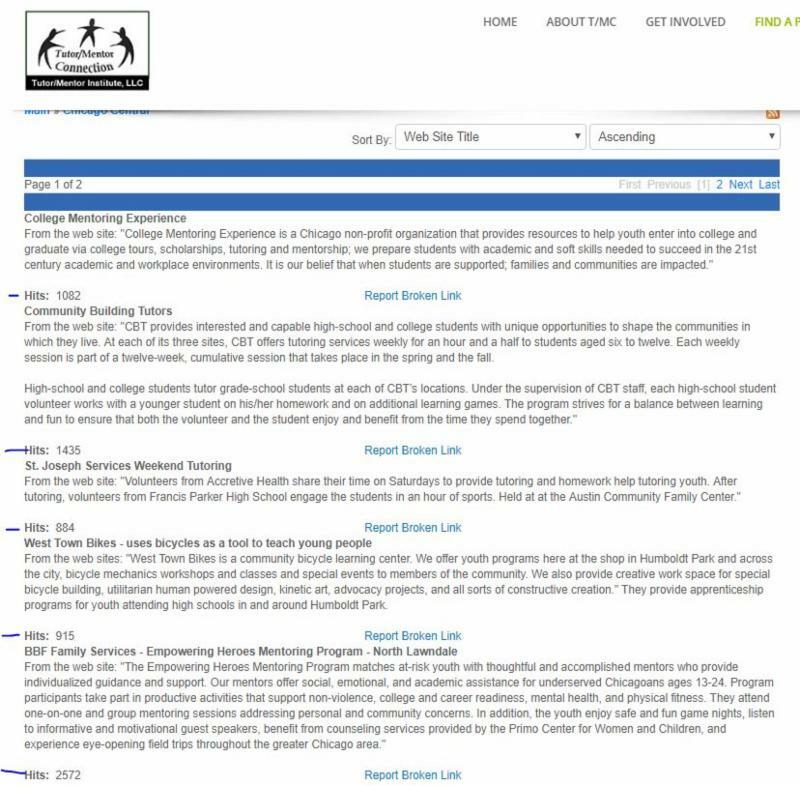 resources for youth mentoring, tutoring and school to work leaders, funders. Maps Show Chicago is Divided City - and Divided Region. How Do We Make Mentor Rich Youth Programs and Digital Learning Opportunities Available to Kids in ALL Low Income Areas? In recent WBEZ articles maps have been used to show the growing divide between rich and poor in Chicago, and the growing digital learning access divide. See these maps in blog articles here, here and here. Why maps? Maps force us to think of all the places where people need help. Without them, we focus on a few great programs, operating in a few places. Concept maps work like blueprints, showing all the work that needs to be done, for many years. Without them we have great pieces of a solution, but not enough to fix complex problems. In the blog articles and PDF presentations I point to you'll see multiple uses of geographic maps and concept maps. Here's one article where I share a few of the key concept maps from my collection. 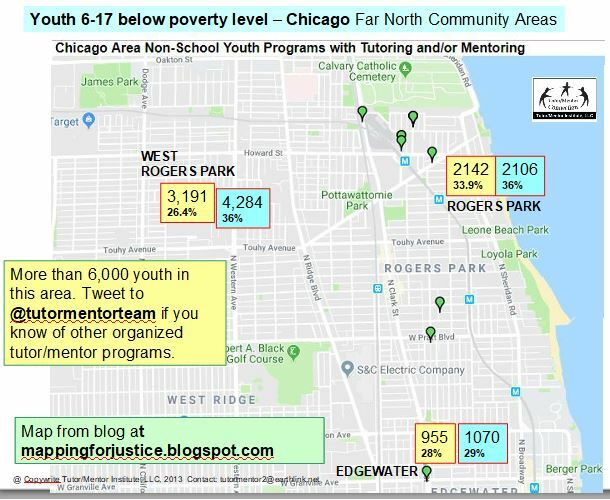 You can use this information, as part of a community group, or Board of Directors, a business, faith group or philanthropic organization, that works to make mentor-rich programs available in one or more neighborhoods of Chicago and/or its suburbs (or in another city). 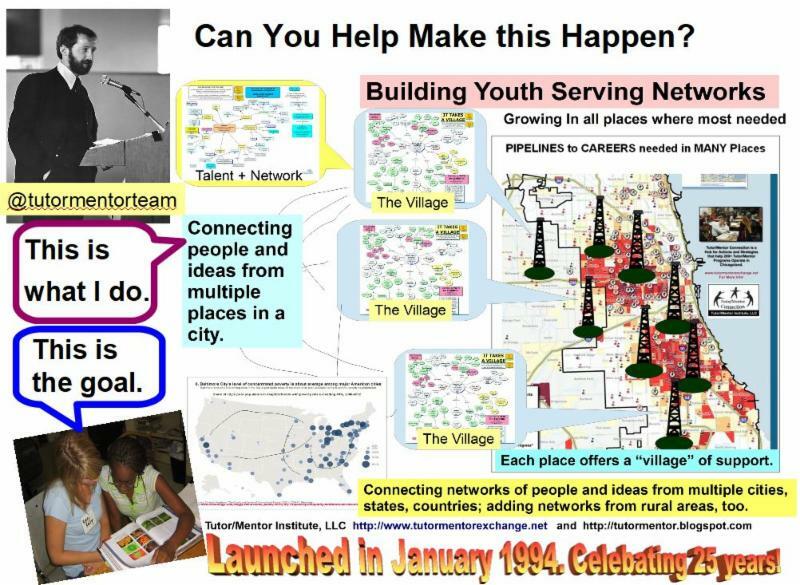 Tutor/Mentor Connection (T/MC) formed in 1993, and Tutor/Mentor Institute, LLC, formed in 2011, point to these maps in efforts to stimulate thinking and actions of more people throughout the Chicago region and in other cities. b) At the same time, we seek to building public attention and draw more people to the library of information and ideas that are hosted on the T/MC web sites. This information base is intended to support actions of youth programs and resource providers, to help every non-school tutor, mentor and learning program in the city get the resources needed to sustain operations and, hopefully, constantly improve by learning and borrowing ideas from others. Planning teams, within programs, at the neighborhood level, and/or within high schools and colleges, could be digging into these platforms, and then drawing people together to discuss ways to support existing non-school programs and to help new programs form to fill voids. This should be an on-going process, but if it starts now, by August new strategies could be in place to draw attention and resources to existing programs, and a few new programs might also have been created. These are just four from a collection of more than 60 illustrated strategy essays you can find in the Tutor/Mentor Institute, LLC web library. Use as discussion starters in big or small group planning and learning. 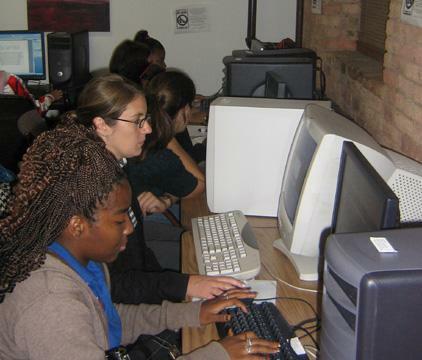 What Tutor / Mentor Programs Are in Your Part of Chicago? Are there Enough? I've been maintaining a list of Chicago area non school, volunteer-based tutor and mentor programs since 1993. Every spring I open each link to make sure it works, see what the program is doing and then try to draw attention to them with a Tweet, or Facebook post. Below you can see how programs are listed in the Tutor/Mentor library. You can sort the list, or re-order it from newest to oldest. Under each listing is a count for how many times that site has been viewed by a visitor to the T/MC site. No one pays for this, so each click is a potential volunteer or donor, at no cost. This information is used to create the maps shown at the top of this article. You can find the map I've been using since 2016 at this link. NOTE: There is a wide difference between the type of programs, both in what they do, and how they show what they do on their web sites. Volunteers with communications and technology backgrounds could reach out to any of these organizations and offer help in shaping and communicating their messages. View the "Shoppers Guide" presentation to see some things I feel should be shown on every youth program web site. 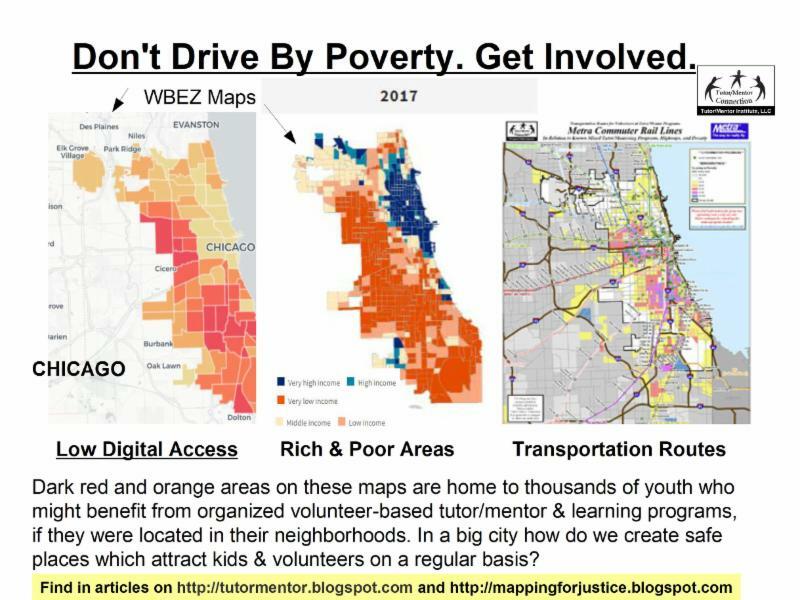 In the maps section of the Tutor/Mentor blog I show a few other sections of the city, but ideally, maps like this would be created for every section of the city, then used by community leaders to find ways to support existing programs, and help new ones form if more are needed. I'm available for a one hour Skype session, at $250, to walk you through the process of creating these map views. This could be done for other cities, too. However, someone has to be doing the initial work of building a library of existing programs, and keeping it up-to-date. I need help updating this information, and sharing it with others. What I do could be a student/volunteer project of a school or faith group, a youth program, or a college project. As poverty has moved into the Chicago suburbs, the growth of youth tutor, mentor and learning programs has not kept pace. For instance, my library only includes three groups in the South Suburbs. There must be more. Or there needs to be more. My goal is that teams adopt specific sections of the city and suburbs and build a deep understanding that not only builds better information about existing programs, or the need for more programs, but also draws people together to use the information to help build and sustain needed programs. Use the contact information below to connect with me if you'd like to talk about helping. Creating a Tutor/Mentor Program Is Easy. Keeping it in Business for 10-20 years, and making it Great at Helping Kids Through School, is much more difficult. 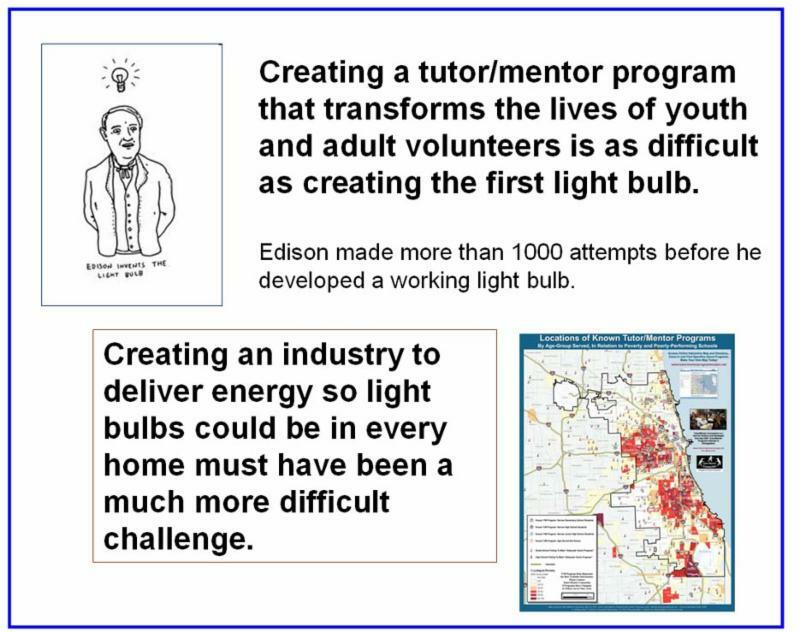 The graphic above reminds us of the many experiments Thomas Edison did before getting a working light bulb. Few people think of what it took to make electricity available throughout the world, so there would be light bulbs in most homes. If you're a parent you know that each of your kids is unique, and constantly changing. You also know you had little training for the job of raising kids. Thus, you're learning as you go. Being a volunteer and/or leading a tutor/mentor program has many of the same challenges, but with many others added on. That's why the Tutor/Mentor Connection was created in 1993. 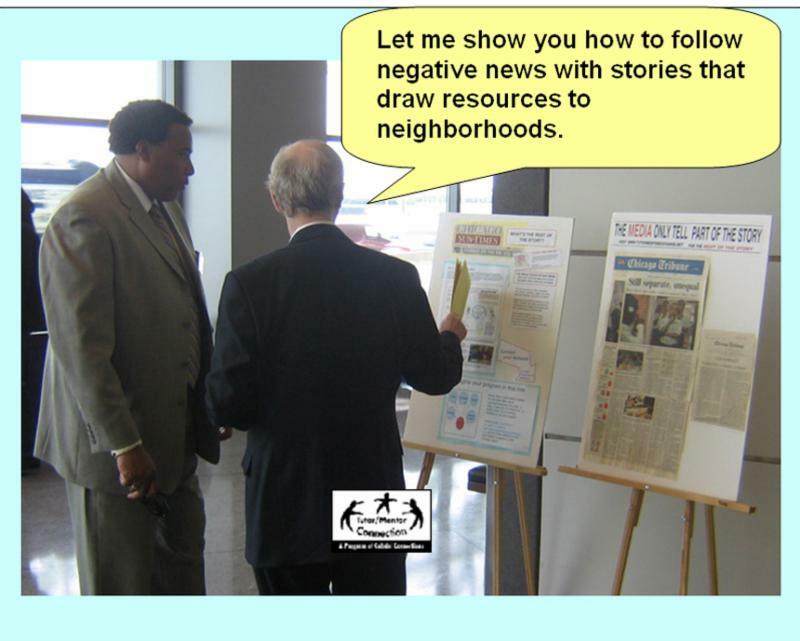 The ideas shared on Tutor/Mentor blogs and in the web library are intended to support the efforts of people in Chicago and in other places who are trying to build and sustain systems of support that help kids in poverty move safely through school and into adult lives. Take some time to browse the library and get to know what's available. An extensive web library is available. Each month new links are added. View this short video to see how you can find recently added links. View this blog article to find links to every section in Tutor/Mentor web library. There's a lot in each monthly newsletter. Bookmark it, or use this ARCHIVE page to find this and previous issues. Can You Help Me Pay the Bills? I've had no significant funding to support the Tutor/Mentor Connection and Tutor/Mentor Institute, LLC since 2011. Thus, I appeal to those who read this newsletter and use the resources to offer your support. To get a sense of what I do, view this document in my Google Docs file, that shows some of my interactions over the last two months of 2018 and the logic behind the information I share on an ongoing basis. Here's are similar docs for January 2019 and February 2019. If you agree this is a value, then CLICK HERE to and use the PayPal, or mailing address, to send a contribution. If you'd like to help re-build the Tutor/Mentor Connection and/or bring it to your own city, let's start a conversation. Connect with Dan (tutormentor) on one of these social media platforms. Help Tutor/Mentor Connection and Tutor/Mentor Institute, LLC continue to maintain this library and help support growth of tutor/mentor programs in Chicago and other cities. and use PayPal to send a contribution. Browse this list and pick a Chicago area youth serving program to see where you can give your time, talent and dollars in 2018.